Summer holidays don’t have to be the usual crowded beach destinations. And mountains don’t have to be for winter only. Mountains offer incredible adventure all year round and are the perfect escape from the daily grind of working life. And with so many adventure travel companies offering incredible ways to get off the beaten track, exploring at altitude is easier than ever. So mix things up a bit this year and discover a new way to enjoy your precious time off with a summer mountain holiday. You might just re-discover yourself in the process. These days most of us crave the opportunity to switch off from it all. To disconnect from the frantic pace of modern life. Where better for that than a mountain wilderness. Breathe in lungfuls of crisp, clean air. Soak up the sounds of sheep grazing the hillsides, birds calling as they soar above, the rustle of trees in the breeze. Mountains present us with incredible wild spaces where you can’t help but reconnect with nature. We may be a little biased, but we think one of the best places in the world to run for the hills is Snowdonia National Park. Snowdonia was the first national park to be established in Wales, back in 1951. This magnificent national park in North Wales is home to 9 mountain ranges, covering a huge 52% of this 2,130km2 protected area. It boasts more than 90 individual peaks, 15 of which are over 900m high. And one of those is the mighty Snowdon, the highest mountain in England and Wales. Snowdonia is home to some incredible wildlife. And thanks to heroic conservation efforts in recent years, many species that were on the brink of extinction, such as the Red Kite (Wales’ national bird) are now flourishing. High in the sky, soaring amongst the mountain peaks, you’ll see other birds of prey too. Buzzards, peregrine falcons, goshawks and merlins are all prevalent here. Don’t forget to glance down occasionally though to spot the rare Snowdon Lily. With it’s swept back horns, black and white shaggy coat and beards, the Welsh mountain goat is an unmistakably sight. Living high up on the rocky mountain slopes for most of the year, they’re most easily seen in winter when they make their way down to lower ground. The mountain forests boast their own wildlife too. Pine marten and deer can be spotted deep in Coed Y Brenin – mountain bikers need to keep an eye out for deer crossing the trails! Even the river running through the heart of Coed Y Brenin is home to the very rare pearl mussel. Whatever your style, a mountain holiday has something for everyone looking to enjoy the great outdoors. 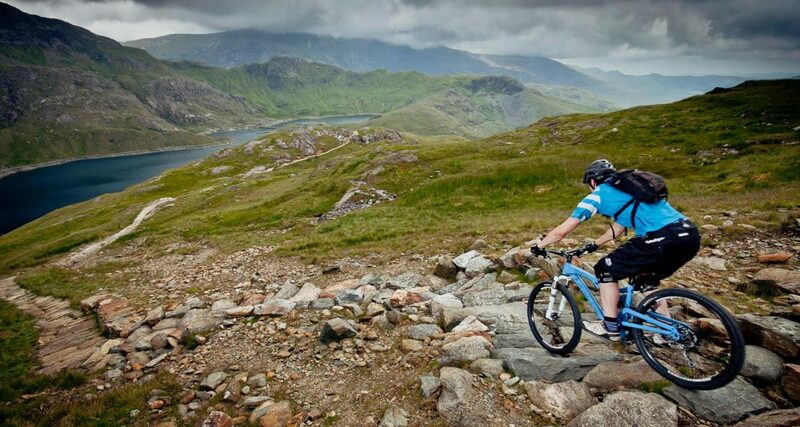 With incredible natural riding and outstanding trail centres, mountain bikers are spoilt for choice in and around Snowdonia. Rocky, twisty, flowing cross country routes and downhill tracks for gravity fans, North Wales boasts some of the best off-road riding in Europe. And with 2,409km of public footpaths weaving around it’s forested slopes and rocky outcrops, Snowdonia is a mountain wonderland for walkers of all abilities. Nothing beats the feeling of summiting Snowdon and seeing for miles around on a clear day. All the way over to Ireland and even as far north as England’s Lake District. Where there’s mountains, you’ll find rivers and lakes. Try a spot of wild swimming in crystal clear water if you fancy a quiet dip. Or if you prefer something a little wilder, try your hand at one of the many river activities North Wales is renowned for. Why not give river rafting a go, or how about canoeing over the world’s highest aqueduct? You could even take on river bugging and pitch yourself face-first down the river rapids on a one-man inflatable raft! Or of course you could ditch the boats altogether. 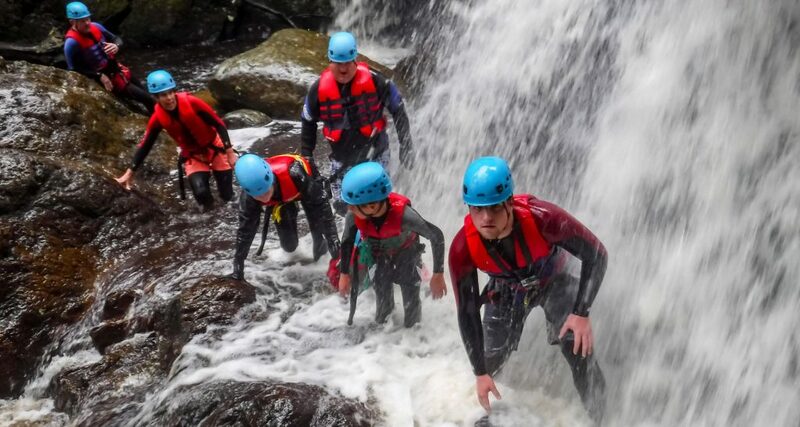 Canyoning is an incredible way to get up close and personal with the river gorge: climb, scramble, leap and splash your way through the water for an unforgettable experience! Adventure Tours UK have a range of multi-activity trips where you can experience all of these activities and more. And because all of our trips are fully-supported, you don’t need to worry about a thing. Simply lose yourself in moments of exhilaration while we’ll take care of the detail. Mountains are the stuff of legends too. With their imposing form, remote locations and extreme nature, it’s easy to see why they’re the birthplace of so many mythical stories. None is more apt to share than Snowdon’s own legend of Rhitta Gawr. Rhitta was the strongest and most violent of all the giants in ancient times, slaying human kings from near and far. Until just one remained: King Arthur. A bloody fight ensued but eventually Arthur defeated the giant with his mighty sword, Caledfwlch. Arthur and his men piled rocks onto the fallen giant, and as the snow began to settle they silently started on their journey home. The place was named Gwyddfa Rhitta, ‘Rhitta’s Tomb’, which over time became Yr Wydffa, the Welsh name for Snowdon. Ready for a mountain escape? So now you know all about the mountains of North Wales, from its wildlife to the activities it offers, and even how the highest mountain in England and Wales got its name. Make 2019 your Year of Discovery and try something new. Try a mountain holiday in this little-known corner of the UK. Check out our fully supported walking, mountain biking and multi-activity experiences.